From The Sacramento Bee. In the photo, teacher Ruth-Marie Chambers, right, hugs Gala Luqman last week after helping him read his haiku poem at Orange Grove Adult School. Doreen Rickman is on the student council, works on the school newsletter and is popular with students and teachers. Rickman, 46, has cerebral palsy, walks with a clumsy gait, communicates in sign language and fits right in with the other students at Orange Grove Adult School. "It's an island of acceptance and love," said her mother, Billie Sue Rickman. 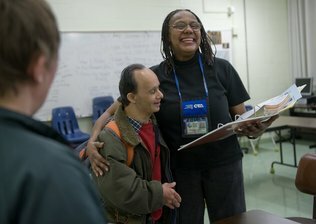 The developmentally disabled adult students at Orange Grove, ages 22 to 80, take classes in everything from journalism to computers. They change classrooms six times a day, work with puzzles to increase brain activity and train for the Special Olympics after school. But Orange Grove may close at the end of the school year. San Juan Unified, which has operated the school near Auburn Boulevard for 36 years, needs the $1.4 million the school costs to help fill a $30 million budget gap, said Trent Allen, district spokesman. All adult education programs in San Juan Unified are on the chopping block. That includes classes at Sunrise Tech Center and Winterstein Adult Center. They teach English as a second language, GED preparation and computer and vocational classes, as well as credit-recovery classes for high school students. The district's adult education programs cost $3.6 million. The budget pains cut across the suburban Sacramento district. San Juan is considering cutting bus transportation for all students except those in special ed, who are protected by federal law. Eliminating buses would affect 900 students and save $2.1 million. San Juan is considering forgoing federal funding for class-size reduction because adding students to classes saves more money. The district says it can save $5.5 million by increasing classes from an average of 23 to an average of 30. Allen said those cuts would save $11 million of the $30 million the district needs to balance its budget for three years – a state requirement. He said the district will make additional cuts next year that could include reductions in the central office. The district of 47,000 students has been able to avoid drastic cuts in the past by spending $37 million in stimulus money and $50 million in reserves, Allen said. It has budgeted its federal Education Jobs Fund money for next school year. There is no cushion left, he said. And district officials are concerned about additional state cuts next year. California has cut $18 billion from its education budget in the past few years. On Tuesday, Gov.-elect Jerry Brown warned that there will be more cuts. The 210 developmentally disabled students at Orange Grove and the school's staff, many of whom have been together for more than 20 years, may be sent to other facilities or, in the case of the students, may simply remain at home each day, parents say. Orange Grove Principal Paige Ashley said the state decided to stop using average daily attendance numbers to determine payments to school districts for adult programs in 2008. Instead, state legislators decided to freeze the amount paid for adult education in a district – and then deducted 20 percent. In return, the state gave school districts more flexibility in how they spent the money, and said the funds cut from adult ed would pay for other programs. The change has worried nonprofits and other agencies tasked with caring for people with special needs. Doug Bergman, chief executive officer of United Cerebral Palsy of Greater Sacramento, said he's concerned other districts will do the same thing as San Juan. His group stepped up to run the summer program at Orange Grove school last year when the district ended its funding. "We didn't want to shut the school down," he said. Bergman said United Cerebral Palsy is willing to take over the school if the Alta California Regional Center can help pay some of the costs – over and above what they pay out for each student from federal and state funds. And the district must be willing to offer a "very cheap" lease. Ultimately, it is up to Alta California Regional to place the students. The organization, which is state and federally funded, serves people with developmental disabilities in 10 counties. "The school is already operating right now," Bergman said. "It makes no sense to close that school down and to relocate those students in other places in Sacramento." Doreen Rickman and her friends don't understand much about budget gaps and finances. They only know that they love Orange Grove. Monday, students filled the classrooms. Curious to see strangers on campus, they extended their hands in greeting, asked questions and eagerly showed off their school. Rickman teared up when asked if she would be sad if the school closed. The woman, whose mother says she has the mental capability of an 8-year-old, put her head on the shoulder of her translator and classmate James Gerhardt. She said she'd miss all of her friends. "There are not many places these students can go," Gerhardt said, looking around the room at his classmates. "I'm very worried. They need this place." PTA president and parent Bertha Mitchel said few schools offer an educational program for developmentally disabled adults and even fewer allow the students to pick classes and rotate periods. The school has several hundred students on its waiting list, Ashley said. "We're a big family," said Ashley. "I can tell you the names of their nieces and nephews, aunts and uncles. We've all grown up together and some of us have grown old together. It just breaks my heart. "We learn more from these guys then they do from us," Ashley said. "They live in joy. They don't judge. They live for the moment and they embrace life. You don't see them worrying about a zit on their face. They don't see the color of skin. They don't see weight. They don't see prejudice." Billie Sue Rickman and Bertha Mitchel said they would keep their adult children at home if the school closes.